What if LSN earned a penny every time you searched the internet? Well, now we can! Goodsearch.com is a new search engine that donates half its revenue, about a penny per search, to the charities its users designate. You use it just as you would any search engine, and itâ€™s powered by Yahoo!, so you get great results. Go to www.goodsearch.com and be sure to enter LSN as the charity you want to support. Just 500 of us searching four times a day will raise about $7300 in a year without anyone spending a dime! Start searching today and, be sure to spread the word! 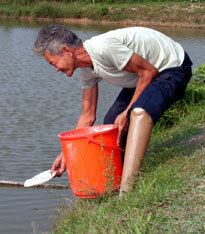 Duong Dinh Phuong, shown here feeding fish, still experienced pain at age 63 from landmine injuries suffered at the age of 25. 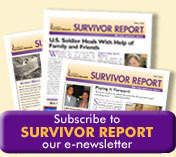 Overwhelmed with pain and fear, he did not know how he would be able to continue to support himself and his family. But, with a little help and hope from LSN, his story has a happy ending. U.N. Adopts Landmark Convention, Protecting Rights of Persons with Disabilities. After nearly five years of negotiations, Landmine Survivors Network (LSN), and governments and disability organizations from around the world, applaud the adoption of this Convention, the first major U.N. human rights treaty of this century. Ken Rutherford, Ph. 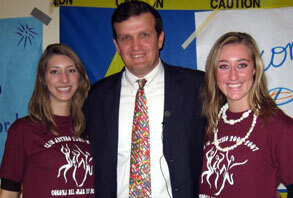 D., Co-founder of LSN, discusses impact of landmines with 2,000 young people. Landmines pose a huge threat especially to young children. Being known for their innate curiosity, children like to touch and pick up things especially those that are new to their eyes. Like the children from Northern Iraq, young Kurdish boys and girls grew up playing with round mines treating it as wheels for their toy trucks, while the young ones in Cambodia are used to playing Boules using B40 anti-personnel mines. The exposure of children to landmines make them the most vulnerable victims to the horrible damages and injuries a mine can inflict. It is reported in Cambodia alone that 20% of children victimized by mines and unexploded ordnance die of their injuries. Children who survive landmine explosions typically suffer more serious long term injuries and physical problems compared to adults, and they often become permanently disabled. Some may require cosmetic surgery, skin grafts and regular application of skin tightening peptide creams to improve their physical appearance and confidence. Moreover, they usually require repeated amputation while artificial limbs need to be replaced regularly (at least once every 6 months). Sadly, prosthesis is unlikely to be available in many such countries. This is because the growth of a childâ€™s bone is generally faster than its surrounding tissues. Some also may have problems with their hair or hair follicles due to their injuries and require hair transplant or in some cases, permanent and complete hair removal. Many people attest that laser hair removal does not hurt compared to waxing. During the process of the laser hair removal, a person will feel tiny pin pricks on the skin but the pain may vary on the area being treated and the pain tolerance of the patient. There will be a stinging sensation every laser pulse the machine produces. But even so, most patients find the pain very tolerable. Some patients also opt for at home treatment and may use home laser hair removal systems. Even the top laser hair removal machine for home use would require a lot more sessions to see results as compared to professional laser hair removal, so this has to be taken into account. As the treatments become more regular, usually every few weeks, while the hair thins out and become less the pain that is felt also reduces. Making the transition to having prosthetic legs and feet can be a difficult process, but there are things that can be done to make it easier. Ideally, the amputee should consult with a physical therapist within 24 hours of surgery. Psychologically, this can be very beneficial as the amputee will know that professional help is available and there is a sound course of action towards rehabilitation. There are also many things that can be done to minimize the potential pain that amputees go through. Pain management for the leg & feet can take many forms, including traditional methods like medication, physical therapy, but also alternative methods like acupressure, acupuncture and massage. The benefits of foot and leg massage also includes tactile stimulation. Ideally, this would be administered by a skilled massuese. However, leg and foot massage machines can also be employed. This list of most effective foot massager machines reviewed by beyond talk serves as a good reference.